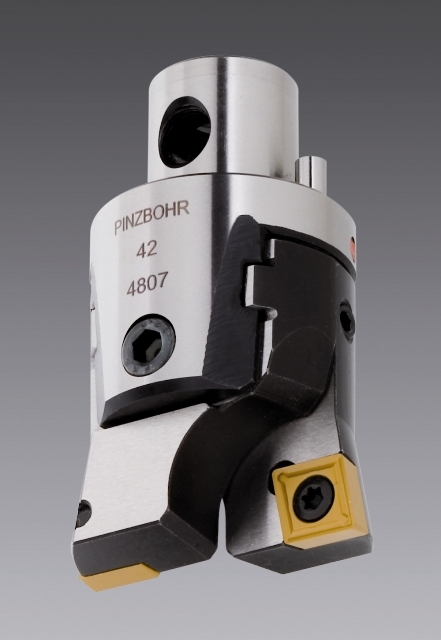 PINZBOHR boring heads for roughing, with two cutting inserts available among several standard geometries, stand out for their high productivity and profitability due to its particular design. An adjusting screw moves, synchronized and symmetrically, the two slides; this allows the user to adjust the required diameter directly on the machine with a caliper or micrometer, without using external presetting devices since slides do not require individual adjustment. These boring heads also feature a safety set assembly designed to prevent mechanism damage or breakage if the displacement of the slides is forced while having the boring head locked or in its range limits.